If you’re working on a budget or just love DIY projects, it is possible to plan your own wedding. Hiring a wedding planner is an incredible luxury – and also a very expensive one. To plan your own wedding all you need is a vision and some basic organizational talents. This will allow you to save money to splurge on something really special. Here are our best stress-saving tips on how stay sane and plan your own wedding without a wedding planner. 1. Organize from the Start. Purchase a wedding planner, but not the human kind. A paper wedding planner! It will help you organize your to-do lists and help you coordinate vendors, stay on budget and find savings along the way. PurpleTrail offers well researched custom wedding planners in two sizes, 8.5×11 and 6×8, with three cover options, hardcover, laminate and synthetic with a frost sheet. It also is available with spiral and sewn book binding. A binder option also available for keeping contracts, spreadsheets and more all in one place. This planner will walk you through all the steps and tasks required to help you plan the day of your dreams. It also makes the perfect keepsake of your wedding journey for generations to come! Set your budget with your fiancé and anyone else who is sharing in the expenses for the wedding. It is standard for a 10% “cushion” is to be built in for unexpected costs or something you just absolutely need to make the big day feel special. Expect to prioritize your expenses. You don’t want to end up buried in debt and you might want to splurge on something unique. Once you have final numbers, write them down and stick to the budget. You’ll thank yourself later. Vendor contracts have due dates. It’s essential to write them on your calendar and mail payments a couple days early. Pay close attention to what’s due and when, as many contracts become void if payment is not received on time. A good paper planner will have sections for tracking and managing vendor payments and details. This is what the pros do and, let’s face it, it’s fun! You can use Pinterest or an old-fashioned bulletin board – just somewhere to keep track of your best ideas. Having these ideas handy will help your vendors translate your vision into a reality. 5. Teamwork Makes the Dream Work. This holds true for not only sports but also wedding planning. This is likely your first project together, so approach your wedding together as a team with your fiancé. You’ll find that dividing the planning and execution of the wedding will make it much easier. Working as a duo will also keep you on track if you tend to veer off budget or task. They will be the ultimate accountability partner. Also recruit friends, family and the bridal party. Give them all a role early in process. 6. Select a Theme and Design. Selecting a theme or look-and-feel will help your wedding achieve a more cohesive style. And best of all, it will be easier to make decisions (and there will be a lot!) with a solid theme in mind. Also consider designing a logo for your wedding. It’s not hard to do and it can be used for your wedding invitations, stationery and website. 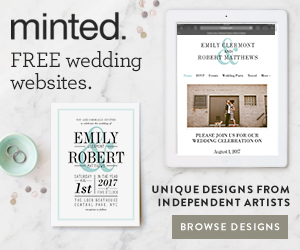 There are lots of designers on Etsy that will help you create an image that you can use on everything from invites to favor tags and decorations. Sit down with your fiancé (and may we suggest a bottle of wine?) and create a wish list of who you would like to attend. Chances are you’ll need to narrow it down and make decisions about children attending and who can bring a plus-one. Doing this early in the planning process will set expectations and alleviate hurt feelings later on. If you’ve been to a wedding you really enjoyed, talk to that couple. What would they do differently? What did they treasure the most? These recommendations will be highly valuable and give you the opportunity to learn from their mistakes. 9. Get a Second (Or Third) Opinion. When looking for vendors, get a second or third quote before you sign on the dotted line. This is something a professional wedding planner would do for you. It takes a bit more time but also might save you some significant money that can be put towards something else special for the wedding or honeymoon. Compare your options – taste food and get samples to find the perfect match for you. Make sure you’re getting the best possible price for the service or product you’re seeking. When you do sign a contract, make sure you read every detail and double check that the date and time are correct! Doing things such as decorations yourself can help you save money and provide a personal touch to your wedding. But the rule of thumb is to only do the DIY that can be finished well in advance. Hire a vendor or recruit help for things like real flowers, food, etc. that are done the day of the ceremony or just before. You’ll want to be able to enjoy your special and not be worried about DIY details. This is one of the biggest tasks a professional planner takes on and one of the most important, too. Day of Coordinators (often referred to as a DOC) can be invaluable. Recruit a friend or acquaintance who has the attention to detail to orchestrate the schedule and last-minute tasks. Even items like who puts out the place cards, cues the band or loads the leftover flowers and favors are important to organize. You simply can’t be in 3 places at once and you’ll need someone to help handle sticky situations without emotional attachment. A DOC can sometimes be hired for as little $1,500. It’s well worth it for the extra time and peace of mind on your wedding day. Go ahead and plan the day of your dreams! It’s not hard to create the perfect celebration of your love.